East is east and west is west and twain shall never meet, whoever said those lines had obviously never had fusion food. Not all experimental cuisine is a success and many a time it is best to let east and west remain separate… and yet I found myself at crossroads one Sunday evening. As I stood with feet firmly in the east but my gaze stretched out towards the futuristic west , with a dosa-burger awaiting my food critiques verdict. It was an ordinary day, and I had not knowingly stepped out in search of adventure, culinary or otherwise. I had no forethought in being wowed by the simple joy of stumbling upon a bizarre concept brilliantly executed; and yet there I was with a group of friends at the Jumbo Bells restaurant in the heart of Madurai, when one of them suggested we try a ‘Dosa burger’. It was not a miss-print, they had clearly meant for both the dosa and the burger to be under the same heading. Not only did the menu offer an exotic hybrid but it also went onto offer this hybrid in vegetarian , chicken, mutton and pork versions!! Dosa is essentially a south Indian snack, made of crispy fried batter flattened out on a tawa, it is served with a ‘masala’ of spicy potato and onion filling sometimes, and comes with its own coconut chutney and lentil sambar. Burger is what I believe to be the western worlds idea of food on the run, with two slices of bun which are used to sandwich a whole sort of meats, or veggies. Generally served with potato fries and ketchup. It takes a brave person to combine chutney with ketchup, and our interest was piqued. Would the Dosa-burger be the next big revolution in ‘east-meets-west’ cuisine? The dosa-burger lived up to it’s name . Two pieces of crisp fried rounds of batter , enclosed its own filling which was also fashioned like a burger. The fried dosa pieces reminded me more of Utthappam like pancakes, but the flavor was undeniably Dosa Batter. We had ordered a chicken-dosa-burger. 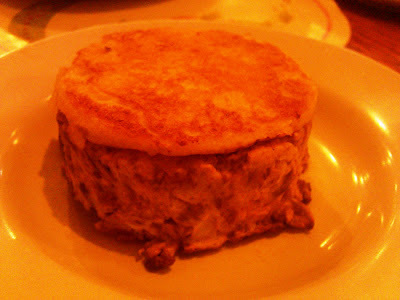 The filling was a mix of chunky pieces of grilled chicken held together by what seemed like scrambled egg. 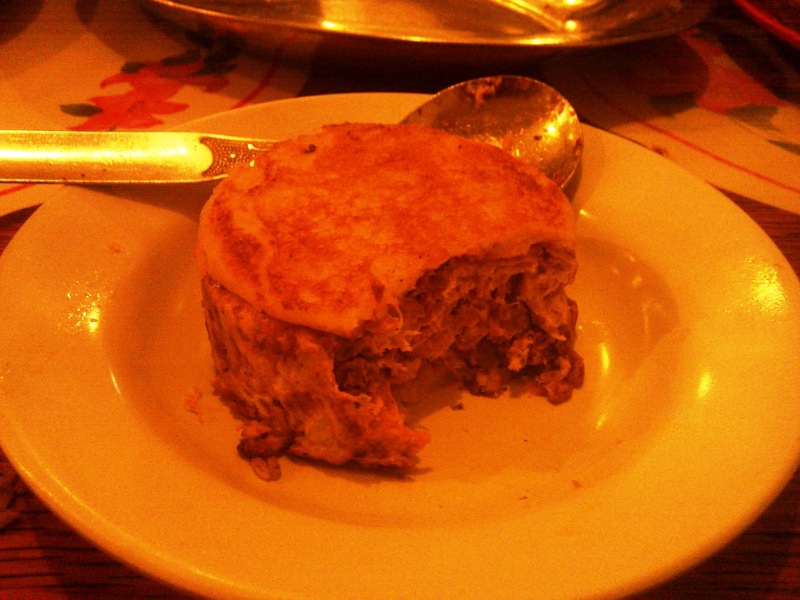 It had beautifully blended the good features of the cuisine of both worlds. Like the food of the east it was spicy and tasty, it was cooked slowly (even though burgers are supposed to be fast food, the waiter warned us the dosa burger would take atleast 20 minutes to make), like the food of the west it had a compact food-on-the go kind of presentation. 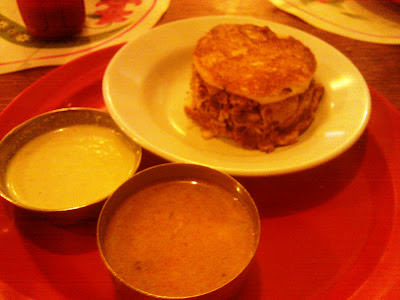 The dosa burger came with it’s own sauces of a coconut chutney and a chicken gravy salaan, much like the gravy served with chicken biryani. But I preferred to have my chicken-dosa –burger with tomato ketchup, somehow it completed the east west fusion, and tasted just right. No matter how interesting a food sounds, the verdict rests on how good it tastes. After a meal of chicken biryani, grilled chicken (also a speciality of the restaurant), tandoori rotis, we still ordered ourselves a second plate of a dosa burger. It was an interesting blend of of spices, a sumptuous wholesome goodness of chicken and crisp dosa dripping with ketchup, a satisfying mouthful of a dish. At 75 rupees, it was the real ‘happy meal’, move over Mac Donalds you have competition. Note: The bell’s restaurant have a few outlets in Tamil Nadu, all of them I think serve the Dosa Burger. I have yet to come across another place serving it. They serve it only after 7 as part of the dinner menu.